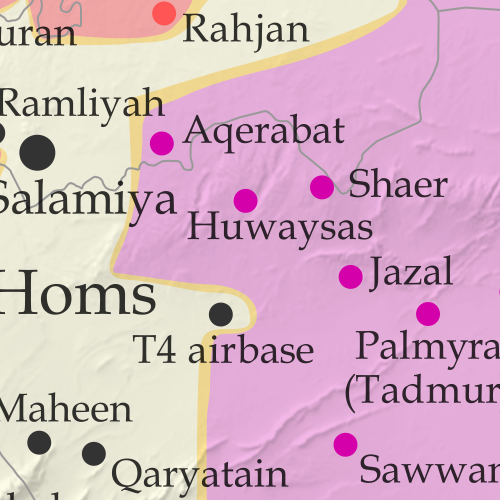 There have been big and important changes to territorial control in Syria in the past month. The Assad government has retaken most of Syria's second biggest city, as well as several other areas of the country, even as the so-called "Islamic State" (ISIS/ISIL) has recaptured the historic desert town of Palmyra. See all this and more on the latest update to PolGeoNow's concise, professional Syrian Civil War control map, which includes a timeline of changes since our previous Syria map report in November, with sources cited. Locations of recent fighting and other important events, including Aleppo, Palmyra, Khan al-Shih, Mayda'ani, and more. Detailed timeline of important events and changes to territorial control since November 23, 2016, compiled by our Syria-Iraq expert, with links to sources.